“Starting” isn’t the first step, not atleast when it comes to Blogging. The first step is the due diligence, the research on which your blog will be based upon, the foundation pillars. Anyone can start a blog, on any topic of their choice, and fail. With the cutthroat competition that the industry has these days, you’ve got to make sure your blog has all the right ingredients that a visitor seeks for, and then some. So without beating around the bush, let me just list the 10 things you need to do before starting a blog. Keyword research is the process of finding the most profitable keywords for you, keywords having some search volume with the potential to bring in some traffic to your site. It’s not exactly the same thing as selecting a “niche”, that’s a broader term, for e.g. you might be a fitness freak and you’re sure you need a site on Fitness. But which keywords exactly are being searched by people around the globe related to Fitness? Which keywords have more search volume than the others? That’s what Keyword research consists of. 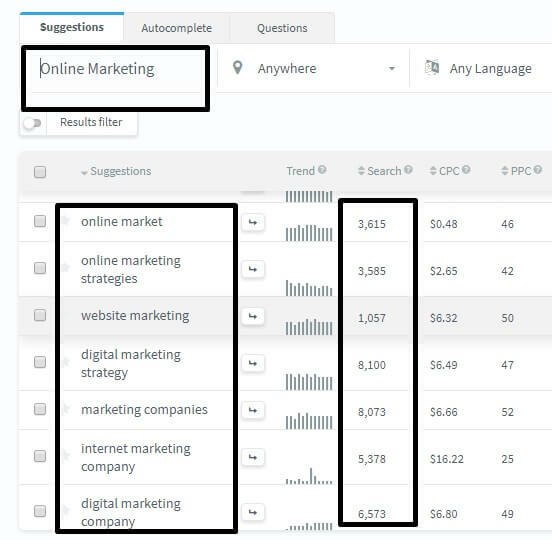 Here’s a basic glimpse of KWFinder fetching us a number of potential keywords based on the niche of my interest- Online Marketing. Keyword research is just the first step, simply finding a keyword with 10million monthly searches isn’t the end of it. If you found it, it’s likely other people have too and have built sites around them. 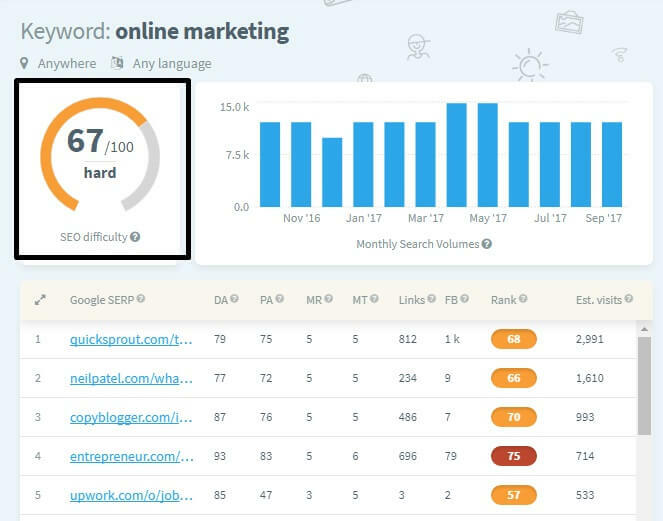 So targeting a keyword or group of keywords just on the basis of its search volume isn’t the way to go about it, cause if the keyword has high competition, you won’t ever rank for it (or would take years), and no matter how good the search volume is, you won’t ever get a slice of it. So, it’s a good idea to check out the competition for a Keyword after you’ve found it. Anything below 30 on most tools is considered easy, 30-50 is “not easy, but achievable”, and it is not advisable to target anything above 50 if you are just starting out. It’s important to have more than just one blog post on your site before you launch it. The visitors who come over to your site need to get that idea of “professionalism” and “Availability of content”. No one likes to go to a site only to find out that there’s just one piece of content. It tells them you’re a new player in the game, and that does somewhat reduce your credibility. Also, having more than one piece of content will increase your “time on site” metric and pageviews, as people might check out other related posts as well which is a good thing. Before you tell the world about this ridiculously awesome blog you’ve just started, it’s a good idea to put in all the elements which scream “this guy/girl is a genius, or atleast knows what he/she does”. The web has millions of blogs, so if people are to trust what you’re about to say, they need to know you’re worth listening to. A common mistake most new bloggers commit is delaying the branding element for a later time, by then, they’ve already lost quite a few followers who would never return to their site. So, if you can put up testimonials, inspiring stories, awards, glamorous pictures or anything else of the sorts, do so, from day 1. The About me page has always been undervalued and not taken seriously. Maybe it’s because people either don’t want others to know about them, or they don’t have anything “awe-striking” to say. Well, you don’t need to! A basic About me page, with just your name, profession, and interests will do. It helps you establish a closer, deeper connection with your audience, something that matters more than its given credit for. Well, it also helps you get approved, or atleast be considered when you apply for Ad-networks or Affiliate programs. Visitor Retention means having a way to reach to your visitors even after they’ve left your site, and being able to get them back for a new blog post, product launch, or anything else at a later time. If you’re not retaining your visitors, you’ll fail in the long run, cause well most people aren’t likely to come back to the same site by themselves. Not unless they’ve recognized you as a brand, and the rule of seven states that they need to come by your site minimum 7 times before they remember your brand or site all by themselves. Hence it’s advisable to use a lead-capture plugin in the least, something where your visitors can drop off their E-mails, and you can reach them when you next publish your post. This is something missed not only by a newbie but also quite a few professionals out there. WordPress in itself is pretty secure and everything, but you never know, and it’s a big setback if you suddenly lose your weeks’ or months’ of hard work. Hence, it’s recommended that you install a backup plugin from day 1. Google Analytics is the best Analytical plugin available to users out there, and it’s free. It’s of utmost importance that you monitor your site’s performance, weaknesses and other metrics from day 1. Once you have an idea of what’s working or what needs improvement, you can start working on those fronts and over time they add up to big results. If nothing else, you’ll need Analytics to get an exact traffic, page views and bounce-rate count. So make sure you have Google Analytics enabled before publicizing your blog to the world. It’s not 2002 anymore, computers aren’t as “exclusive” as they used to be, infact in 2016 for the first time mobile internet usage surpassed that of computers! 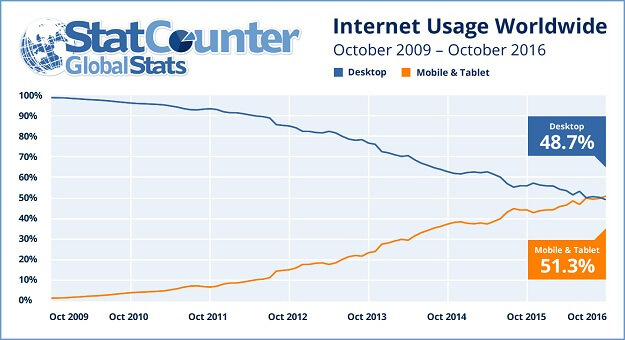 And if you take a look at the graph below, computer internet usage has a downward slope, while mobile’s has a steep climb (source: BGR.com). The climb proves that in the coming years, mobile internet usage will only go up. Not to mention the Mobilegeddon from Google in 2015 which made “responsiveness” of a website a major ranking factor. So bottom line, make sure your theme, CMS and overall the complete site is mobile-responsive before launching it. Not a lot of bloggers do this, but you should. Let’s say you have a Facebook profile, and suddenly one day, a post saying “How to do X and X” is shared by you, why would anyone care? You’re just a random guy, sharing a random post like the other half a million Facebook users! Instead, if you connected to like-minded people before the launch (you can find them in relevant groups), told them you’re going to launch a blog, on topic X, and then shared a post couple days later, it might get the attention it needs, won’t it? Another strategy is to make friends! Yeah, it pays off. Connect to other bloggers in the same industry, compliment them on their posts, suggest improvements and what not. Or if you have some funds you could invest, let’s say $10-50 (yeah that’s enough) you could start a giveaway, to the first 100 comments on your blogs (you could choose 1 or 2 winners) and gift them something. Bottomline, “launch your blog to the world, before you launch it” (I hope you got that)! 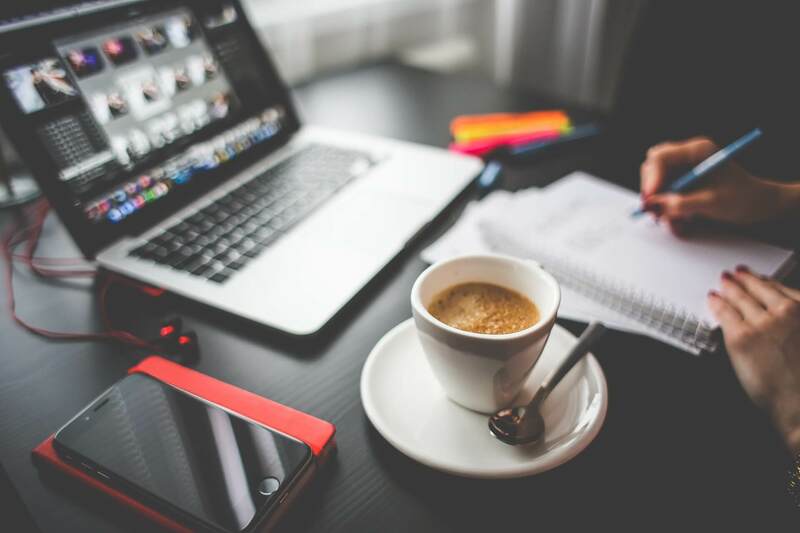 These 10 things are by no means the end of things you need to take care of before launching a blog, but these surely are the most important ones. You can come up with your own ideas and tiny-bits of perfection, the end goal is to make sure your blog doesn’t have a single loophole, be it from the technical, aesthetic, material or any other angle. Anyway, feel free to share your ideas with me in the comments, chances are you may have struck a golden nugget and I might include it here on this list (with proper credits to you). Complete SEO guide for beginners like me. All these 11 steps are showing a different kind of useful information and all these are must be working to get organic traffic. I needed to follow all these steps for my growth. Please add an article about perfect Keyword Research. Thanks for sharing such a great post with us . Hi Admin, I’m glad to find this Nice Article that shared such a great post about Things You Must Do Before Launching Your Blog, There are many young Bloggers those want to Launch their website they should read this article to understand the valuable thing to Launch a Blog.